This entry was posted in Poetry and tagged Art, Belief, CS Lewis, God, Grace, Hope, Life, Light, Love, poetry, Redemption, Writing. Bookmark the permalink. 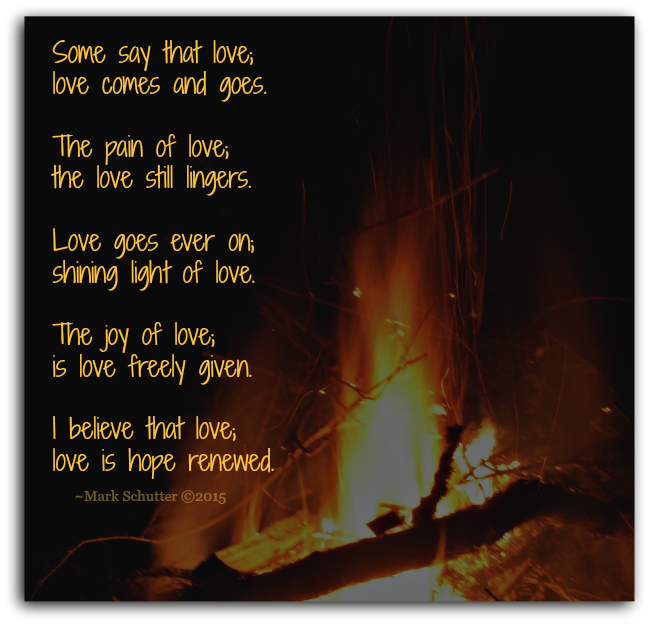 Hi mark congrats on the lovely poetry and beautiful post. I am delighted that you thought of me to participate in the love challenge. I did enter a poem in this challenge earlier and had great fun Again thank you and hats off to your fabulous poetry . Thanks Holly! You are welcome to write another poem if you’d like but no worries. Thanks for the nice comment. I will read whatever you write as it is all that good. Not sure how I missed your “love in 10 sentences” post. I will have to search for it. Yeah! You did it. It took me a week to finally do it after I was nominated. Great stuff. Congratulations. I totally cheated because I didn’t use love in every sentence and I didn’t used only four words for each one either. Then again, I should have read the rules again before I went for it. I liked your poem and some rules just need to be broken. Thanks again for nominating me. Thank you Mark for nominating me. I entered a similar competition about love so not sure how much of that topic I have left in me this month, lol! 🙂 No matter what though I appreciate you thought of me for it. Your poem is wonderful! Thanks Christy! No worries, just know that you are an inspiration.